I apologize for my lack of blogging. However, with my travel schedule and the holidays I have been just too busy to keep up. 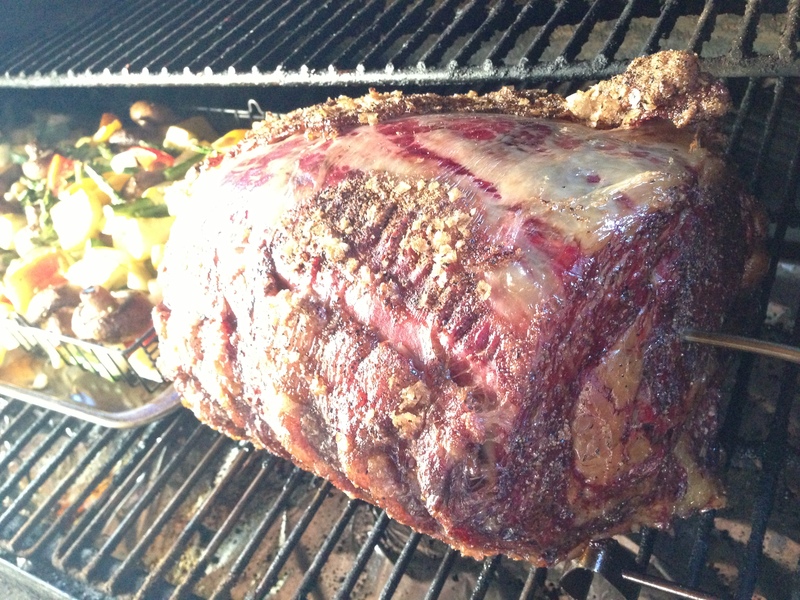 I had a few phone calls the past few weeks on how to do a few different kinds of roast on the bbq. So after I received this photo I decided I should probably put it on the blog so that it is easy to follow. Plus a buddy of mine sent me a prime rib for Christmas and some Lobster so what a perfect time to do it. Thank you Reed! The first thing I do is bring the Prime Rib Roast to room temperature and season it. I like to use an aluminum throw away pan and a grate that sits on top, just to get good circulation and collect my drippings for an au jus sauce later. I never say exactly how much to put on, because the size of the Prime Rib differs. I just liberally apply it, sometimes I wrap the roast in plastic wrap and let sit in the fridge over night. What it is important is that it is seasoned very well. This was a photo sent to me from a friend I was giving advice too. I called it a salt lick. This is what I call too much seasoning. Because you are using a smoker, the salt crust idea does not work. It does not allow the smoke to penetrate the meat. Bring the Traeger Grill up to as hot as you can get it, 450 degrees. Set your roast in the center, shut the grill and turn down to smoke. Keep a meat probe inserted into the meat. This is the most accurate way to determining when you Prime Rib is ready to be pulled off the Traeger. This is also very important to keep yourself and your friends that come over from opening the bbq smoker and letting all your heat out. Also, if you are getting behind and the temperature is not reaching internal meat temp of 120, you can turn up the heat to expedite the process. Just keep watching that temperature gauge. It is the most important tool in the entire process. Always use a meat probe in the middle of the meat. I serve my Prime Rib at Medium Rare. The end cuts are always medium. If you get that weirdo guy that always has to have his meat well done you can always cut a slice and put it back on the Traeger and have him finish it. Everything that you do with a Prime Rib with regards to smoking is based on your meat probe that you have inserted in the middle of the roast. EVERYTHING! If the roast is cooking to slow, you can bring your temperature up to 350 degrees to finish. As long as you pull this bad boy at 120 degrees. Then cover it with aluminum foil, lightly tented. Then let sit for twenty minutes!! This is important, juices should remain in the prime rib, not running off the cutting board. While that sits, I take my lobsters that I prepared and put in the oven on 425 degrees and let cook for 10 minutes. When the roast is done sitting, it is time for the slicing. The meat should have some medium rare at first, but often keeps cooking. Time to take the Lobsters out of the oven. They look perfect, a little side of garlic butter and you are in business. Plated and set family style, with some scallop potatoes, Sherry’s Famous Macaroni, all sauces and three sides, its GO TIME. It is easy as that. Remember, if you do not like to use the juice in a sauce, do not be afraid to pour some over the top of the plated Prime Rib. This blog is for my pal Kim, the Salt Lick BBQ Champion. This is one of the best and most in detail described recepies I found on how to cook a prime rib. What pellets do you use? I have heard that oak is the best to use because it produces more smoke. What it your experience on that? How long per pound does this take? Hey Eddie sorry for the delay….I just noticed hundreds and hundreds of comments. So to answer your question I use Traeger Hickory, however, I know the company that makes them for Traeger and he told me….it doesn’t really matter they are all the same. This looks absolutely amazing!! Cant wait to try it on my traeger! This is a really great, and well described recipe!